The San Diego music scene is in the midst of a revolution and this revolution will not be televised! It is occurring in the warm, often sweaty music clubs along El Cajon and Kettner Boulevards, where the seekers come for inspiration to break up their weekly doldrums. There are many bands well worthy of some tan-time in the sunny spotlight and it is our ethos at ListenSD to setup the recliner, apply the lotion and plug your earbuds into some of the freshest vibes hitting the Diego waterways! How did The Lulls begin and how long have you boys been playing music together? The Lulls started in the wake of the death of Ed Ghost Tucker. Once we got some ideas out there (while we were tracking our last Ed Ghost Tucker EP, “Everything Changes”), we wrote our album in a couple of months or so. We tracked the album in about four days, and the last year has just been waiting for mixes and masters to come back to us. So it has been a slinky of a process. We’re just relieved to finally be able to release it. We’ve been playing music together since we were 9 I think? Your debut album is titled “Island of Daughters” (to be released 9/30). Thematically if I may ascertain, lulls can refer to the time between ocean waves and we have an island in the title of the album. Is this “Island of Daughters” a tropical, peaceful place where everyone is frolicking in the ocean OR is this more of a female lord of the flies survival scenario? Or you can ignore my dorky guesses and explain what the name signifies to you. Haha, well we chose the band name because we wanted something that reflected the sound we were going for. A lot of that sound does have to do with the rhythms and tones of the water, but the dreaminess and sleepiness associated with the word “lull” (floating, quietness, lullaby, etc.) also play a part — not to mention the fact that we’re really funny (lolz). As for the title of the album, “Island of Daughters,” that comes from a sort of refrain in a song that Cameron and I co-wrote called, “Calafia”: “An island of daughters / was calling … An empire of daughters / has fallen.” The song has to do with the myth of an Amazonian warrior queen named Calafia who was said to have founded the colony of California as an empire of black women (during the 15th and 16th centuries the Spaniards thought California was an island). There are a lot of geographical and feminist themes running throughout the album, so the name “Island of Daughters” seemed to sort of encapsulate everything in three words. Pulling it all together is our album artwork, which was largely painted by Kelsey Brookes‘ (abstract pop artist who did a lot of work for RVCA and Red Hot Chili Peppers) 3-year-old daughter, Lively. 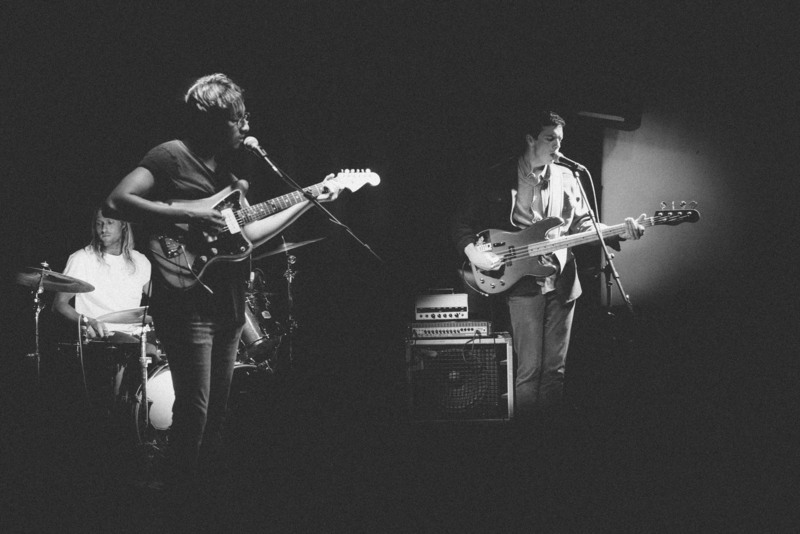 The Lulls are one of ListenSD’s favorite local bands! What are some of The Lulls’ favorite local bands? Well that’s good to know; we’re flattered. Right now, we’re in a Garden Echo / Gloomies phase, but I’m leaving out quite a lot, I’m sure. I like what Spooky Cigarette are doing, too. The Lulls have only been a band for about a year and has already done a big West Coast tour & has a national tour that includes Soda Bar on 8/31. What is one of your favorite memories from your last tour and which city are you most looking forward to visiting on your upcoming dates? My favorite memory from last tour was when we played Kennewick, Washington. I was trying to describe our sound to the sound guy before we played, and his very serious response was, “Oh, so you’re like Green Day?” That night, he and the bartender were the only people at our show. I think they were both disappointed. Second best memory: our packed show in San Francisco. I’m looking forward to New York City the most, because a lot of my friends live there, we’ll be playing Mondo.NYC and we’ll be releasing our vinyl there. I have heard through my secret indie music gnomes that there is a skate video on VHS starring you and Cameron. Do you guys still skateboard and if so longboard or shortboard? Oh, I’m sure there are many skate videos of us on VHS — all varying degrees of shame-inducing. The last time I skateboarded was in college when I broke my ankle and the bone went through the skin. After being abandoned by one ambulance and learning (the hard way) that I was allergic to morphine, I woke up from surgery flapping my arms. The very concerned nurse asked me what I was doing, of course, and I responded, “I’M TRYING TO FLY!” A metal plate and seven screws later, and I’ve given up the art. Also, definitely shortboard. I must admit, I have quite the disdain for anybody who longboards. I can’t speak to the last time that Cameron skated, but I’m sure it was more recently than I. I also can’t speak to his opinion on longboarding. Beyond your national tour and official album release (quite a feat! ), what do the Lulls have planned for the end of the year and into 2017? We’ll be releasing our vinyl in New York City and playing a release show in San Diego sometime in November, but other than that, we don’t have plans other than making sure this album makes it into as many ears as possible. The Lulls are performing at Soda Bar on Wednesday, 8/31 with a stellar indie/psych lineup including Mild High Club & Heavy Hawaii. It may already be sold out so snag your ticket!